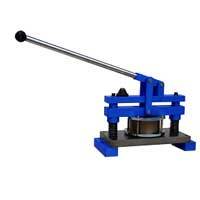 The Punch & Die Cutter manufactured and supplied by our company supplied is intended for accurate and rapid preparation of test pieces for use in tensile strength tests, ring crush tests, folding endurance test, water absorbency test and other similar tests without any deformation and damage. Our Punch & Die Cutter is suitable for cutting a very wide range of sheet material such as plastics, textiles, paper and paperboard. Multi test sample cutting is simultaneously feasible. Our Circular Punch & Die Cutter is an excellent and convenient precision cutter for speedy and accurate cutting of specimen 100cm2 in area without any deformation and damage. Our Circular Punch & Die Cutter is extremely useful for the determination of basis weight in paper machines profile when used in conjunction with GSM Scale. The Punch Cutter we offer has a high capacity and several layers of paper profile can be punched out in one operation simultaneously. 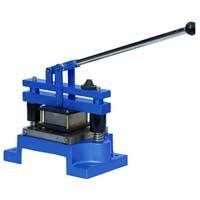 Cutting base is included in our Circular Punch & Die Cutter. Avail our Precision Punch & Die Cutter for Speedy and accurate cutting of circular & square samples, without any deformation and damage. Our Precision Punch & Die Cutter is suitable for cutting a very wide range of sheet material such as plastics, textiles, paper and paperboard. Multi test samples cutting simultaneously feasible.